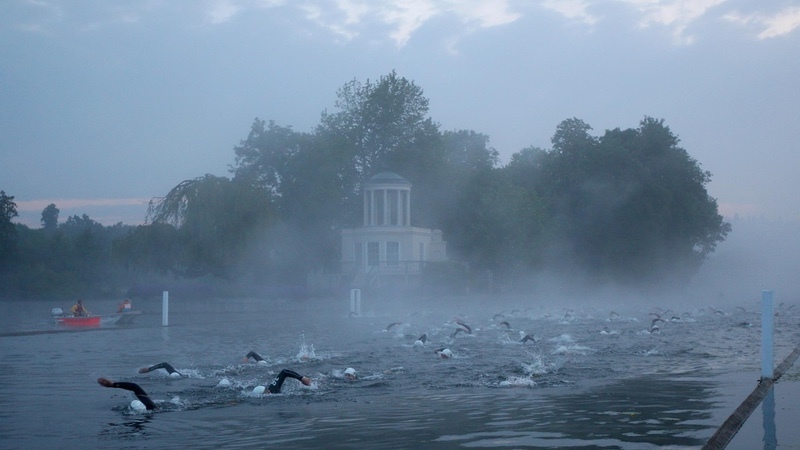 The Henley Classic is one of the oldest mass participation swims in the world – dating back to 1892. Those who win the annual race get their name inscribed for eternity on the base of an antique trophy kept in the Henley River and Rowing Museum, in Oxfordshire, England. How did Henley Swim come about? Passion and more passion! Who would have believed it, all those years ago when Jez Laming and myself (and our silent witness Andy Thomas!) had this stupid idea of swimming the Royal Regatta course in Henley, that I’d be here, trying to capture what has happened, 15 years later! It’s safe to say that the journey has been bumpy at time, testing our collective resolves, friendship and marriages; although happily both wives seem to be just as supportive now as they have ever been. Unpaid and often unnoticed, they have been there, and this above all else is the factor that has kept us going. Tell us about the challenges you have faced? The low point for all of us must be 2012 when heavy rains once again turned our placid bit of England into a whirling dervish. The Classic had to be called off just hours before its scheduled start time of 4.30am! Two weeks later and our newer event, The Mile, also had to be cancelled at the last minute. There are some pretty exclusive event t-shirts kicking about for a swim that never happened. Various brave/hardy/foolish people swam anyway, unofficially, and the consensus was that we were definitely right to cancel. On the day it is sheer exhaustion that surprises people. Events need setting up and striking down. It’s the packing up that really kills though. We’ve often been up for well over 30 hours by the time the last swimmer has gone home, hopefully with a smile on their face. But it’s then that the really hard work starts. Physically and emotionally drained after the actual swimming has ended, we need to pack up and leave the venue in a better state than when we found it. When it’s time to go home, we can barely stand, and over the years I’ve learned to take the next day off work. What have been the highs? It’s the charities we work very hard with that will benefit more and more each year as we get bigger. Swimming interesting events seems well aligned to raising money for good causes, so we’ll be working even harder to make that happen. Over the years we have developed some fantastic relationships with all sorts of people that continually surprise us to this day. There are too many to mention here, but we hope you know who you are. We try our very hardest to make them feel welcome and appreciated, because without them none of this would happen. It’s not possible to run these things without teams of volunteers, and it’s their enthusiasm that drives us forwards. So too is the fabulous feedback we get from our swimmers. We know we are not big by some standards, and we know we don’t have lots of banners and flags that larger events might enjoy, but for us, it’s all about the swim. We are only doing what we want to do ourselves, so it’s crucial that each of our swims has its own personality, otherwise it’s just laps around a lake. We are constantly evolving and testing our thinking. We even tried for a couple of years to do the ‘laps around a lake thing’ because people asked us to. Over at Oxfordshire-based Queenford Lakes we were certain that we’d hit upon a winning formula that no one else had dreamt of. If you were there you’d have enjoyed a relay format of lake swimming with lots of furious and close quarter swimming. But alas a lack of interest meant the end of that idea. Maybe in the years to come we’ll re-think it? But we simply refuse to do something boring. How has the series of events developed; and what is an important legacy? So here in 2019 we are looking forward to four very separate events that we hope will appeal to the very youngest, oldest, fastest and slowest. We are blessed with a great bit of river, and that is our final legacy here. If we all swim in our rivers, lakes and seas it has to follow that they will all become cleaner. It is a self-fulfilling prophecy we think. Birds and fish do their business in the river, we all know that, but that is natural, and never hurt anyone. But what is not natural is uncontrolled discharges, or littering… anywhere. Small fuel spills from leisure craft are not an issue in fact – they happily disperse very readily. But how can anyone these days deliberately pollute our waterways when they know for sure that swimmers are present? All of us, collectively, are the best way to make sure things become cleaner by joining the various open water clubs springing up, and by entering events, to give us a louder voice. And look out for clean water campaigns like our friends over at London Waterkeeper. I’m not sure what I’ll be saying in another 15 years. Fashions, fads and trends come and go, but this feels like a long lasting one to me. I’ve done all our events, but it’s the original Classic that still, even as I write now, makes the hairs on the back of my neck stand on end. It’s such a daft idea to get up in the middle of the night and go swimming in the murky waters of a twilight Henley on Thames, that I’ll readily admit it still gives me nerves. But the sense that it’s not what most people could bring themselves to do that makes it so life affirming. The sense of achievement we have built as a small team makes me very proud indeed – both as a competitor and as the co-founder. When we discovered that people were racing in the river in the late 19th century, we felt like the baton had suddenly been picked up again by Jez, me and the team here. It’s our job to keep hold of it properly this time and maybe someone in 2104 will enjoy writing about our 100 years of The Henley Swim.